← Upcoming Event: Sophie Blake and MY BIRTHDAY!!! About a month ago (WOW where has the time gone?!? 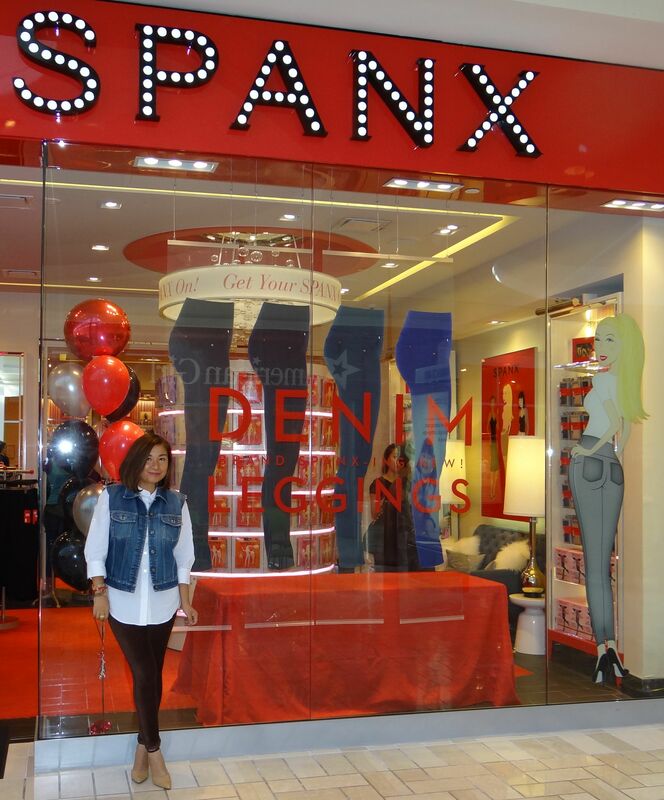 ), I accompanied my girl Carlis to the Spanx store(the Popular shape wear brand) at Tysons Corner Center Mall. She was hosting their booty bash to help introduce their denim leggings — the latest addition to their collection of leggings and shapers. Like these great cords both ladies have on!!! 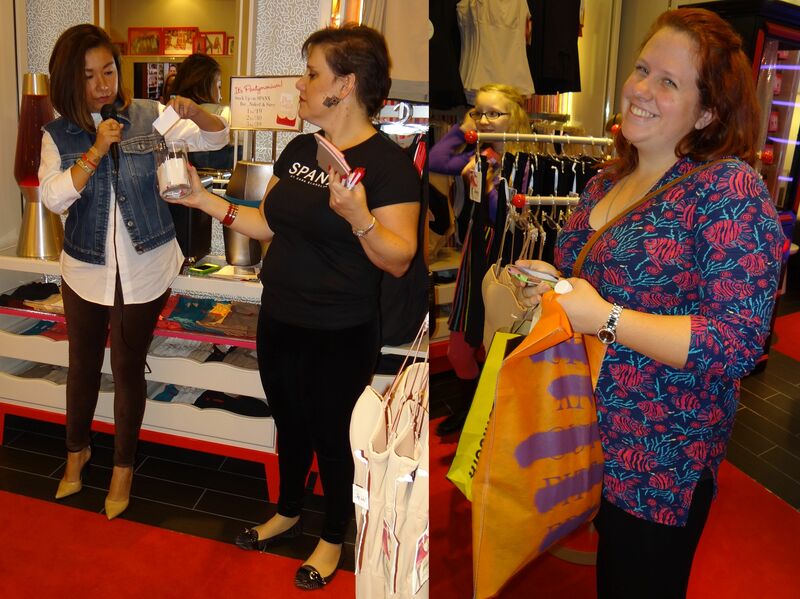 The first 25 shoppers scored a gift card with a surprise dollar amount to use towards a purchase during the party. Guests have a chance to win giveaway prizes every 15 minutes from the tower of power. The tower of power where you can all the Spanx classics!! This lucky winner got to choose one and guest also scored a Spanx booty bag (aka lingerie bag) with a purchase of $50 or more. Because a party is not complete without goodies and snacks!!! So back it up again to the beginning and check out this store front! Love the neon lights decorating the front!! It might not be the manliest place to wait while your lady shops but it sure looks comfortable!! They had some great outfits to show off from Talbots accessorized or paired with Spanx!! I want the Colorblocked Sweater Dress (which is now on sale!!! ), the white sweater with the cords is killer and the work number on the end is such a classic. Love love LOVE!!! And they gave everyone there 30% off!! 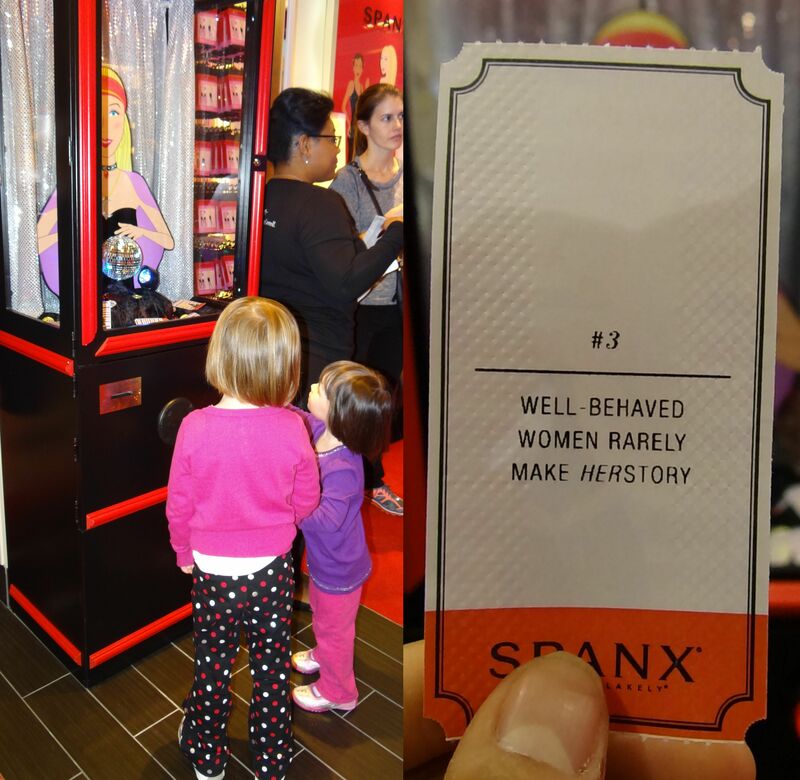 There was a great “fortune” telling machine in the middle the kids and adults enjoyed alike!! Something that surprised me were the man spanxs!!! This brand is so much more than I think many people realize!! They are growing into much more than a simple shapewear brand. They really do have everyone cover, tip to tail! They have some Couture pieces, some regular and high waisted leggings and a convertible strapless bra. Those are just a few of the many necessities that can be found at the store. Sara Blakely is really creating an empire!! So glad I was able to document part of the growth and meet all the wonderful staff at Tysons!! Make sure you go visit and tell them Spicy Candy sent you cause she convinced me to go try something new cause every great outfit needs a solid foundation! !